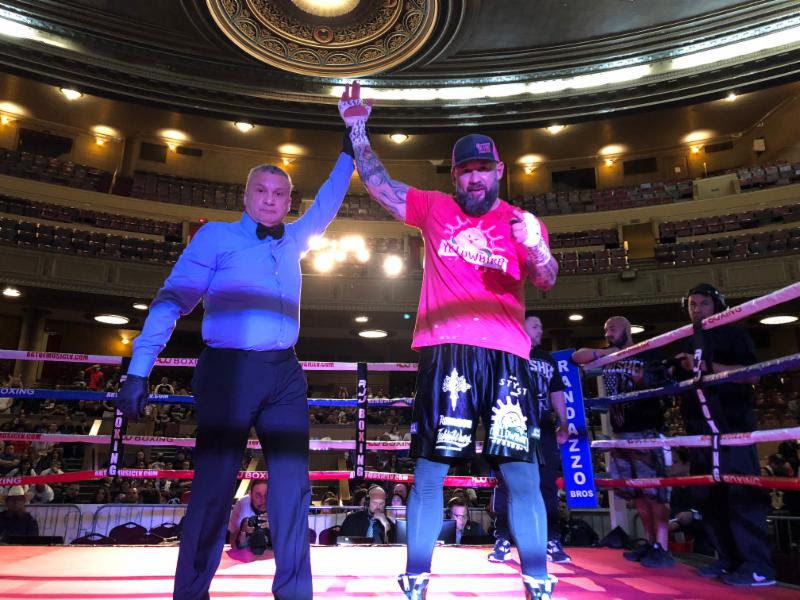 Last night at the Scottish Rite Theatre in San Antonio, TX, TMB & PRB Entertainment and Roy Jones Jr. Boxing Promotions, presented, “Whose ‘0’ Will Go 2”, where Kendo Castaneda (15-0, 7 KOs) captured the NABA super lightweight title with a unanimous decision victory Gilbert Venegas Jr. (10-1, 6 KOs), handing him his first loss as a professional. In the early rounds, both fighters were having their moments, landing hard shots, but as the fight progressed, Castaneda started to get in a grove by going to the body. Venegas held his own but couldn’t get his punches off like he wanted too, and Castaneda started to take over the fight. In the later rounds, Castaneda was landing three punch combinations, while boxing from a distance, finishing the fight strong. At the end of the ten-round fight, Kendo was up big on the judge’s cards. Scorecards read 98-92, 99-91,100-90, all in favor of Castaneda. Local hero, Luey Villareal (4-0-1, 1 KO) captured the ABF middleweight title with a stunning TKO against Michael Klekotta (2-4, 1 KO). Villareal broke down Klekotta for the first three rounds before stopping him with a barrage of punches in the fourth round. The time was at the 1:20 mark. 18-year old sensation, Ricky Medina (2-0, 2 KOs), scored a second-round KO over Jorge De Leon (0-5). Medina landed a powerful uppercut in the middle of round two, sending De Leon to the canvas. He then followed with a devastating right hook to the temple, knocking out De Leon at the 2:58 mark. Xavier Wilson (9-0, 1 KO) remained undefeated with a unanimous decision victory against vs Gelacio Cruz (2-4-3, 1 KOs). Wilson used lateral movement to land his punches off angles. Scorecards read 40-36 twice and 39-36 for Wilson. In a battle of hometown fighters, George Ramos (2-0, 1 KO) defeated Steven Ramos (4-1, 1 KO) by way of unanimous decision. George Ramos landed the cleaner shots and was the aggressor. Scorecards read 40-36 twice and 39-36 all in favor for George Ramos. Local native, Dagoberto Navarez (5-0, 1 KOs) scored a fourth-round majority decision over Stetson Horne (0-3). Navarez was the aggressor, coming right at Horne from the opening bell, landing overhand rights. Horne had his moments but didn’t do enough to keep Navarez off him. Scorecards read 39-36 twice, and 38-38 for Navarez. In a battle of middleweight prospects, Washington Luiz (1-0, 1 KO), who was making his pro debut, scored a fourth round TKO against David Godley (1-1). Luiz was circling to his right, landing accurate counter punches throughout the fight. A right hook, straight left combo hurt Godly, knocking him out on his feet, forcing the referee to stop the bout at the .45 mark of round four. In his pro debut, Christopher Martinez (1-0, 1 KO) scored a second round TKO over Mathew Glover (1-1), ending the bout at the 2:59 mark. A flurry of right hands sent Glover to the canvas and the referee waved off the bout after Glover was on wobbly legs.